Mild Steel Expandable Safety Barriers are versatile and portable offer solution to pedestrian traffic control problems, suitable to restrict access to temporary prohibited area and often seen their presence in shopping malls, exhibition or event booths functions etc. Compact, portable, lightweight suitable for indoor or outdoor use. 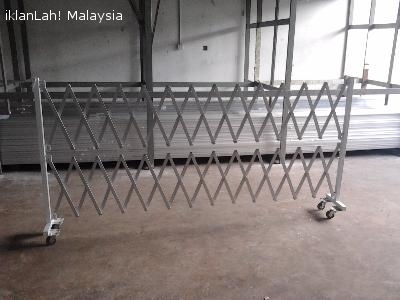 Mild Steel Aluminium Hollow Section Expandable Safety Barrier 1300mm (H) x 3000mm (L) market and sale by Flexijoint Industrial Marketing & Services, Kuala Lumpur, Malaysia. For further enquiry, please contact us at T: +6 03 79541136 M: +6 016 3111313 F: +6 03 79808259 E: flexijoint.ims@gmail.com.